CLASSIC BIRTH ANNOUNCEMENTS are printed with the headings: “Name, Arrived On, Weight, Length and Born To” on inside panel of card. This format is perfect for those desiring a traditional, handwritten announcement. Cards are $1.80 apiece with a minimum order requirement of 10 cards. 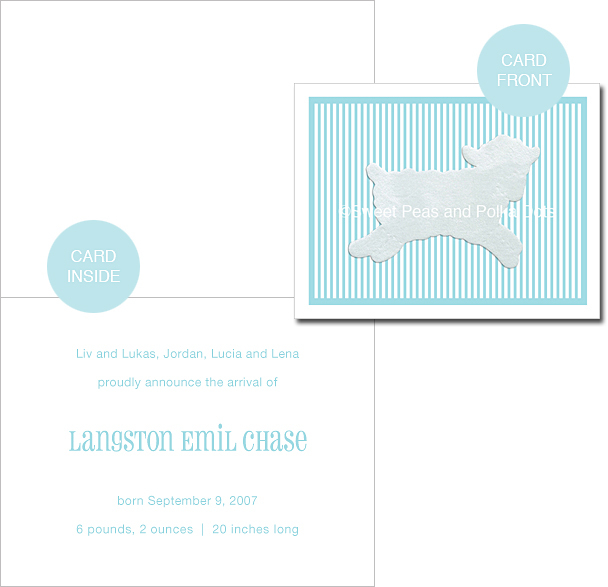 CUSTOM BIRTH ANNOUNCEMENTS have announcers’ names, announcement text and baby’s birth information typeset and printed for you on inside panel of card. Cards are $2.94 apiece with a minimum order requirement of 50 cards. PHOTO BIRTH ANNOUNCEMENTS showcase baby’s picture in a luxurious, layered design. Picture can print in color, black and white or sepia tones. LUX applique and fabric, baby picture and birth information panels are hand mounted on coordinating color cardstock. This format is for those desiring an exclusive, high-end announcement. Cards are $6.54 apiece with a minimum order requirement of 50 cards.